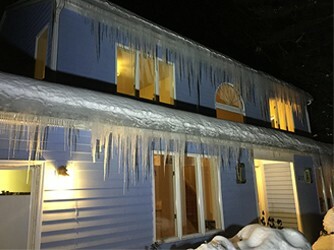 What is an “ice dam” and what causes it? Ice damming occurs when melting snow runs down the surface of a roof and refreezes. As water runoff refreezes, the ice builds up and begins to dam the subsequent runoff, causing it to pool. Unfortunately, roof shingles are designed to shed water runoff and don’t perform well under standing water. 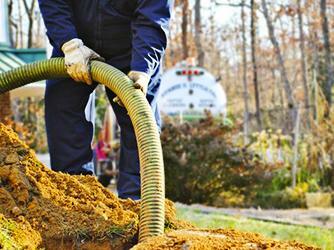 Pooled water can find its way under shingles and can damage hidden seams and fastener holes. Water that refreezes under the tabs can expand and lifts the shingles. Such conditions can expose the interior of your home to additional water damage. The water damage occurs when warm air in the attic space heats the underside of the roof deck and leads to melting snow and water runoff. Any runoff that makes its way to the eaves can freeze and lead to ice damming. Freezing rain can also trigger the ice damming cycle even when snow is not present. Additionally, water that reaches the gutters may freeze before draining at the drop outlet. 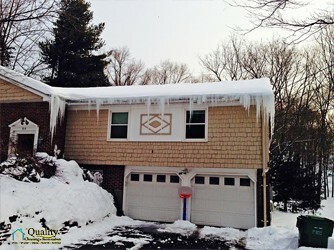 Ice damming can also occur when gutters and downspouts are full of debris. Roofing companies design shingle roof systems to channel water from the high points of the roof to the lower sections. Water should exit the roof through a gutter system or by dripping onto the ground naturally. Shingle roof systems are not designed to hold water or prevent water from entering the interior due to ice damming activity . Ice dam leaks are caused because the water could not escape from the shingled roof area. This is not a roofing system design flaw or an indication of a poorly installed roof. Ice dams form under winter storm conditions which prevent the shingles from shedding water as designed. The best corrective action is to remove the barrier of ice at the gutter line or to remove the ice buildup on the roof before it melts from underneath. Think safety! Working on a roof under icy conditions can be costly and dangerous. Removing ice from your gutters and roof may cause further damage to the affected areas and create additional repair and expense. Place the melting agent inside a pair of pantyhose to extend the melting process After applying a melting agent carefully chip away the ice Do not strike your roof with an axe, hammer, or any tool or device that will damage the shingles. Use extreme caution on ladders and roof surfaces. Many serious injuries occur to people who fall while trying to clear ice and snow from roof surfaces. You should work with an insured and qualified professional to manage and mitigate ice damage. Your home has been provided with roof vents to control attic moisture and temperature levels. However, some snow storms may blow snow into the attic creating extensive damage. Homeowners should check their attics after heavy snow conditions. It is the homeowner’s responsibility to remove any snow before melting occurs. At no time should attic vents be obstructed or reduced in size.